A three-day FO! And one of my favourites to date! I had some fun with a self-timer photoshoot. Next small sweaterish thing will be Elspeth, which I’m going to focus on for the next little while. Have I mentioned that I’m on a yarn fast for the month of August? I’m doing well so far, and I think I can actually do it! Main motivation is the Kitchener-Waterloo knitter’s fair in September, so I’m gonna save up my money from this month to spend there! Excellent. Laura it looks fantastic. Great job. I can’t wait to see it in person. And I’m also on a yarn fast….maybe we should have a support group! It’s beautiful! You are such an inspiration (and I think you can knit faster than I can talk!). Love checking your blog – but it sure does make me feel slow. Happy Knitting. It’s so pretty! And you can’t beat 3 days. Good stuff! Wow, that looks great! I like what you did with it. The addition of the ties is great. Loving the ties! It looks stellar on you! I can’t believe how fast you kniw! Your minisweater is way cuter than mine…I used the wrong yarn, and I didn’t dig the puffy sleeves. Yours looks great! Beautiful! I’ve always been fond of wrap sweaters, and you did an excellent job. Looks fantastic. 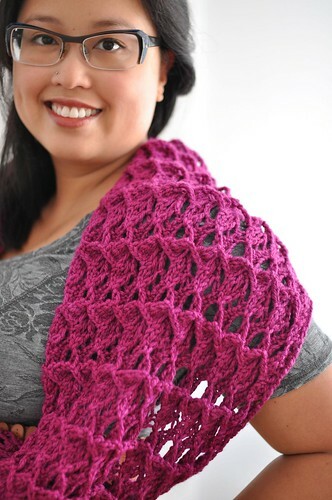 You completely amaze me how fast you knit. This must be a stupid question, but how did you get the sleeves NOT to be puffy like the original design? Simply gorgeous! Looks great on you! And so quick, too! I love all those self-timer shots, especially the fourth one down where you’re puckering your lips – so Rowan-esque! I love how you’ve turned this into a wrap. It’s beautiful and I’m always amazed at how fast you knit. I love how you’ve modified it into a wrap! I’m close to finishing the same pattern (minus your adaptation) and you’ve really inspired me to get that bad boy finished, stat. Cute cute! Love the long ties and the fashion-y photos. No buttons to worry about. Great job on the minisweater! I do have a question on how you modified it into a wrap sweater? I am very interested in making this minisweater and like your modifications. Thanks! Wow I love your minisweater! And great self-timer photos! I love the colors! It’s beautiful! Wow. You were working on that when I was in the store last Friday. Inspiring. Well played! hottttt! i’m making one – right away. i hope you bring it to snb tonight. i will, of course, have questions. That is just gorgeous! I may take this one on! So, I know this was posted ages and ages ago, but I’m just now starting my own minisweater, and as Lisa wanted to know, I was curious how you made the sleeves ‘un-puffed’, and if there were any other modifications you made to the pattern aside from adding the tie. Thanks in advance for any info!